"Web address" What it implies? Index.html- actual file name of webpage. http - Hyper Text Transfer Protocol signals computer to “Transfer” “Hyper Text” (a webpage) from the internet to your computer, http:// is automatically assumes by computer. www - World Wide Web is the body of software rules and protocols that means internet, every webpage is part of the world wide web. Further top level domain name is classified into many, respectively divided and set into particular identity. 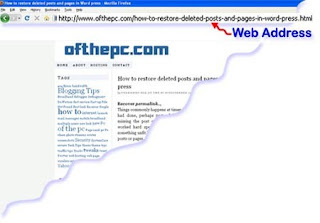 I think this post will clear few fundamental doubts about Web Address, what it actually means, helps especially kiddies to kindle over net, those newly entering Web that will be helpful for them start blogging or sites.., who knows they may start blogging or sites even from their infancy but sure its going to be a fancy full one.